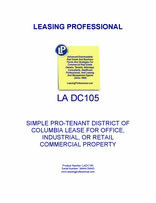 This form is for a single tenant Washington DC lease where the tenant has superior leverage. It gives the tenant the right to use the premises for "any legal use," and has very abbreviated remedies for the landlord in the event of a tenant default. It is anlso pro-tenant in character because of the clauses it does not contain which customarily appear in pro-landlord forms relating to remedies and a variety of other pro-landlord provisions. The major industry in Washington D.C. is that of government; however, the city also enjoys plenty of tourism and business thanks to the government’s location. The majority of commercial real estate leases in Washington DC relate to office buildings, shopping centers, industrial properties, and other commercial real estate located in The District.